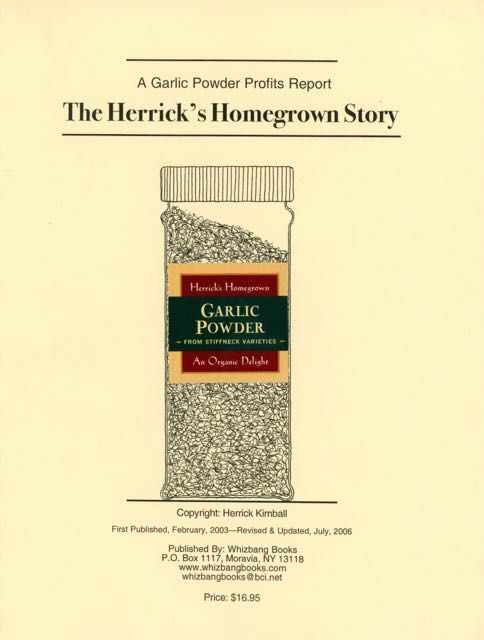 This 27-page profits report by Herrick Kimball tells how he priced, marketed and packaged his Herrick's Homegrown garlic powder. Originally published in 2003, updated in 2006, and out of print for several years, this profits report is now available once again. Growing garlic, processing the bulbs into homemade garlic powder, and selling it can be a wonderfully satisfying part-time home business. I know this to be true because I had a great little garlic powder business for nine years (1998 to 2007). I discontinued the business, not for lack of sales, but for lack of land—the property I had been using to grow my garlic was no longer available. Besides that, I decided it was a good time to focus on other entrepreneurial ventures. The pdf download being sold here is a scanned copy of the 27-page Garlic Powder Profits Report that I first published in 2003, and updated in 2006. I originally sold the comb-bound report for $16.95. This profits report does not tell you how to grow and make garlic powder. That information is covered in my 2003 book, The Complete Guide To Making Great Garlic Powder: Homegrown & Homemade Secrets From a Garlic Powder Guru (which is now also available as an inexpensive pdf download). What this report discusses is how I marketed, priced and packaged Herrick’s Homegrown Stiffneck Garlic Powder (An Organic Delight!). This report also contains a good dose of my “philosophy” about how to create a successful garlic powder business, and is summed up in 10 Keys to Success When Building a Sustainable Garlic Powder Business. Also included are pages showing examples of things like the yearly postcard I mailed to my customers, and the information sheet I included with every jar or bag of garlic powder that I sold. In the back of the profits report I provide some additional ideas for using your homemade garlic powder to create other value-added products. This 27-page pdf is a scanned copy of pages from the actual report. Since this report was last updated in 2006, the prices given are out of date. I’m sure that I would be selling a 2.8 ounce jar of garlic powder now for more than the $10.25 I was getting in 2006. But I tell you how to figure your costs and determine a price for your powder, and that hasn’t changed. I was once contacted by a buyer of this profits report who informed me that he felt the information I was selling was worth far more than the $16.95 he had paid me. He told me he would have been satisfied with spending a hundred dollars for the report and suggested that I should charge more. As you can imagine, that was some mighty encouraging feedback. But I didn’t take the advice. And now, after being out of print for a few years, here I am bringing back the profits report and selling it for even less! I would love to see more enterprising people pursue this high-quality, value-added, niche market. It isn't "easy money" and you won't get rich at it, but making and selling garlic powder from your own homegrown garlic bulbs can be a financially rewarding and very satisfying little business.